While attending University of North Carolina at Chapel Hill — and a whole lotta pig pickins — we discovered a shared passion for true wood-smoked BBQ and the deep-seated culture and friendship those gatherings reinforce. Throughout the next decade and a half, while starting families and hosting our own barbecues, we realized it was now our turn to continue — and pass on — this heart-felt tradition. Always sure to have lots of fun, we’ve stayed “old school” by making rubs and sauces from scratch and cookin’ “low and slow” with hardwoods (gas-free) for anywhere from 10-20 hours. With overwhelming support for our “old school” approach, we decided to see how we stacked up against the pros. Our two-man team — plus good friend ‘Rick Rick’ — packed the truck full of Hope Valley hickory wood and headed to our first cookoff, the well known Annual Hillsborough Hog Day. 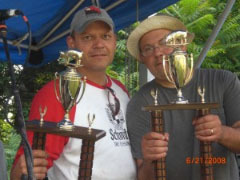 Using our ol’ #14 BBQ sauce-and-rub combination and our “old school” techniques, the Bull City BBQ team ended up taking home the trophy. What a day for the first timers! 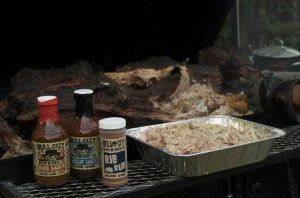 From that day forward, Bull City BBQ had legitimate “street credibility” in the old school circles — and we haven’t looked back. We are very excited to have had Bull City BBQ on the map now for 8 years! We hope you’ll buy — and enjoy — some of our unique rub and sauce recipes that we’ve created over the years. What a journey it’s been so far…and what a journey we’ve “only just begun.” Please join us for the ride.